I spent two weeks in Italy last month and, in case you haven’t heard, it is one of the most beautiful places on earth. So it was appropriate that I attend a match of the ‘beautiful game’, aka calcio, football, soccer. The game was Fiorentina (Florence) vs. Sampdoria (Genoa), and it had some importance so a large crowd was expected. 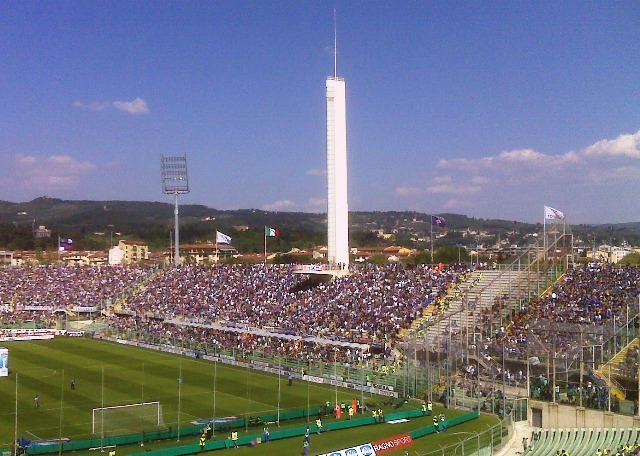 I set out on the number 51 bus from Florence’s historic centre, bound for a suburban stadium near the Tuscan hills north of town. 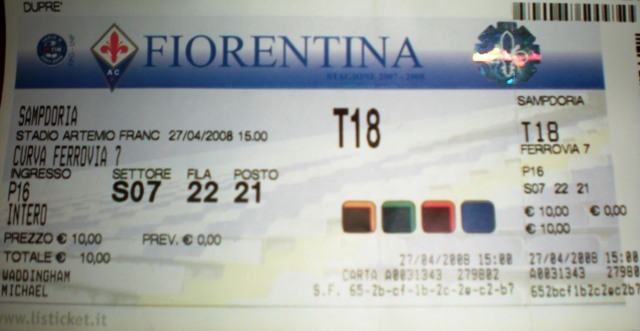 45 minutes before game time the bus was full of purple-shirted — and well-behaved — Fiorentina fans. Once near the stadium I realized that I had no idea of where to buy a ticket, so in my pitiful Italian I asked assorted gate personnel, coffee shop clerks and fans where the ticket office was. I found one in a cafe across the street. 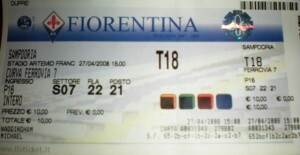 Inside there were big signs, in English, saying that English fans could not buy tickets for games here — they had been previously banned from Italian soccer stadiums, presumeably due to poor behaviour over the years, and therefore tickets for all foreigners had to be officially dished out by the club. Nevertheless I enquired at this cafe and was told, no, I had to go to the official ticket office down the street; my pasty Englishman-like complexion and bad Italian quickly (and correctly) labelled me as being a tourist. The game turned out to be spectacular mostly because of the fans’ behaviour. My seat was in the family end of the 45,000 seat stadium. At the opposite end were 15,000 of the most rabid home fans, and to our right — in a fenced and plexiglass section — stood a mass of rival Sampdorian fans. Below us were a smaller collection of younger, energetic home fans and between the two were several dozen brightly uniformed crowd enforcement officers. Throughout the game, the Sampdorians screamed, sang, chanted, raised fists and — when Sampdorian scored — rushed headlong towards the plexiglass. The surge of 4,000 manic fans was accompanied by wild shirt-tearing off and the noise of 40,000. In turn, the enraged Fiorentina fans below me rushed towards the security personnel, raised their fists, hoisted middle digits and flung insults toward their guests. On this day, the surge was just a feint, and there wasn’t much more than some light shoving with security at the perimeter. And even if they did burst through, a chain link fence stood in their way. Then the unbelieveable happened — with only a minute left, Sampdoria scored! The Genoa faithful rushed down the terrace, more shirt-flinging and frothy-mouthed bellowing! The locals below us surged again, but it was less energetic — they knew as I did that we’d just been tied by these invaders and what good would a bloody clash serve at this point? It was a fascinating spectacle, even though no true violence took place. And it became very clear why my identity was confirmed prior to buying a ticket. What if I was a hooligan looking for trouble? What if my gang and I decided to bring smoke bombs, darts or other projectiles to lob into the visitor’s section? Only by checking the thug database prior to entry could such debacles be minimized. As for the game, click here for the highlights. Next Next post: Seccuris Inc.